It can be extremely difficult to keep warehouses clean and properly ventilated, especially when they are large, open areas. The first issue is to identify the quality of air in the warehouse. The second is to have a system that will effectively filter polluted air and ensure that the air those working in the warehouse breathe is clean and healthy. In some industries, large workshops and open areas need constant ventilation. But in others, it isn’t necessary and ventilation can rather be activated when required. One ideal solution for warehouse environments that require dust extraction and needs-based ventilation is to use an AirWatch device together with a CleanAir Tower. Both Kemper America products, AirWatch and a CleanAir Tower work together to ensure that the air in the warehouse is constantly monitored and then ventilated when required. A compact device measuring 700 mm x 200 mm x 372 mm AirWatch weighs only 11 kg and is simple to install. It measures particles from 0.1 μm in size and dust concentration from 0 mg/m3 to about 15 mg/m3. There are various ways to install the device: with a suspension set, a wall bracket, or with a specially designed column. Once installed, AirWatch will constantly monitor the air quality in the warehouse. It has a traffic-light warning system that indicates whether the air is good (green light), suspect (amber light), or below the acceptable quality (red light). Detailed data including measured values can be viewed at any time using a tablet or smartphone that has the appropriate app loaded. Not only does AirWatch monitor whether companies are operating within legal limits and complying with their own target values – which might be higher than the legal limits, it also increases safety, protects the company’s investment, increases employee trust, and is a tool that helps to save energy, in this way also saving costs. Another clear advantage of AirWatch is that it efficiently controls extraction systems and room ventilation. 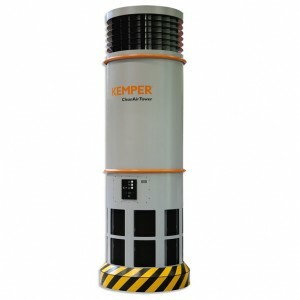 Ideal for warehouses and production halls where local extraction systems don’t work well or are not adequate, Kemper America’s CleanAirTower operates according to the principle of displacement ventilation that is recommended by many health and safety organizations. It has a Cyclone pre-filter and two-stage PTFE-membrane filter that can be cleaned, as well as cartridges that enable one to dispose of the dust and other pollutants in a contamination-free manner. At the top of the tower, a 360-degree intake mechanism takes in contaminated air. Clean air is released back into the warehouse from the bottom of the tower. The system is extremely efficient and generates minimal air turbulence. The air is circulated very slowly using a low-impulse system. Unlike most other ventilation systems, the CleanAirTower doesn’t require any hoses or complicated set ups. The combined usage of AirWatch and a CleanAirTower is ideal for warehouses and workshops where sources of dust and smoke change, and are not consistent. If you would like to buy the two devices or explore whether this is the best solution for your warehouse environment, call us today.